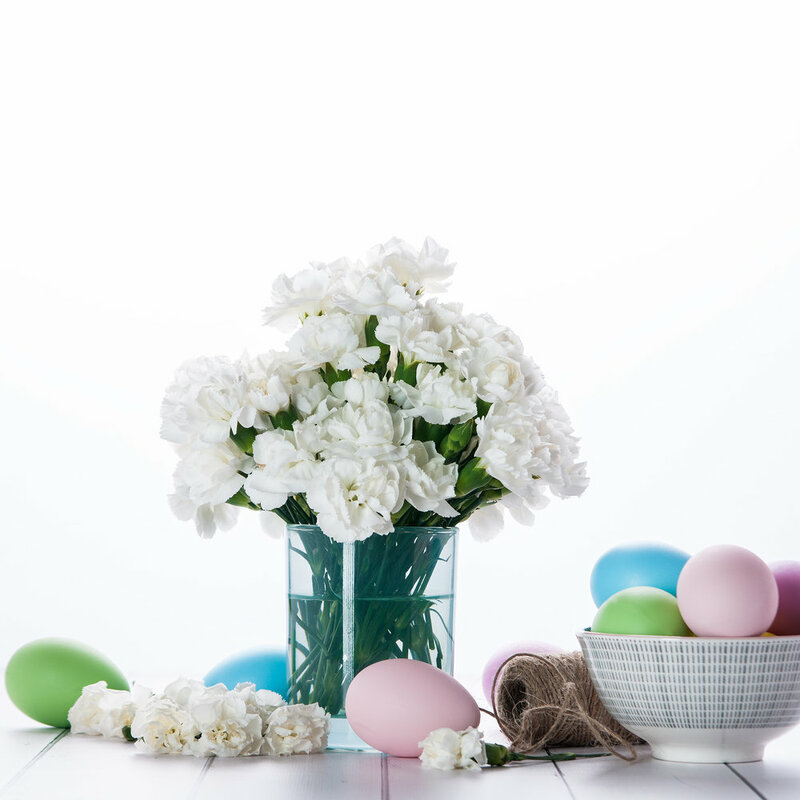 When it comes to creating your Easter Dinner plan there are a lot of things to consider like how many people are coming, how many children will be coming, do any of your guests have a food allergy or special diet restrictions, are just a few major considerations. When it comes to Easter I like to keep things traditional but still being mindful of all the variables. I think if you have decided to host it’s your responsibility to be considerate and offer a little something for everyone. It’s really not all that difficult these days to pick up something to accommodate those on your guest list that need vegan, gluten free, nut free, or dairy-free options. For example, if your sister's child (your niece) has a nut allergy then find the nearest Whole Foods, Fresh Market, local Bakery, etc. that have something nut free so that you can surprise her and so she is not excluded. Since I know you all have many variables to consider, the menu (below) I put together is to simply help get your creative juices flowing. I recommend selecting menu items that can easily be changed or swapped out for things that can satisfy any quest requirement without the need to prepare or cook a separate dish. When hosting a full dinner the best piece of advice I can give you is plan, plan, and plan. Try to get as much of the prep work like shopping, chopping, cleaning, set up tables/chairs, get the table scape ready, and get the serving stations ready in advance. Doing more beforehand allows you more time to spend with your quest because without preparation before you know it your guests will be done eating and planning their exit and you haven’t even left the kitchen. Try to find the freshest in-season ingredients so that they look and taste great. You can use these fresh in-season ingredients to enhance your salads, cocktails, and appetizers. If you planned on blackberries (as per the menu) for the salad, appetizers, and cocktails and they are awful maybe select blood orange, grapefruit, strawberries, etc. Then simply swap out the ingredient in your planned menu. If you prefer feta over goat cheese, pistachios over almonds than again simply switch it out. I like pairing ham with a red wine such as pinot noir. The ham is already sweet and salty so when paired with a pinot noir, the wine will help balance the salty ham. Pinot Noir is typically smooth, and silky, with notes of dark berries and dry finish. It’s an easy drinking wine that will keep your guests wanting more. I recommend that you select one from France. As for my personal favorite let’s talk about white wine. I selected a Gruner Veltliner. Again it pairs well with the sweet and salty ham. It's slightly peppery, has notes of fruit, dry but offers a nice balance of acidity. I recommend that you select one from Austria. When we are talking about Easter beer I would go with a hopped selection. I gravitate to the freshest local IPA. Trust me nowadays you have so many options. EB’s Favorite Hoppy Beer selection is Single-Cut Brewery (Astoria NY). Before I forget always offer a “Mocktail” for your company. The Bunny Tail Blackberry Lemonade is a delightful twist on plan lemonade. A “hostess must haves”make sure to have a few bottles of sparkling water and pitchers full of regular water out for your guests. I don’t like when a guest has to come into the kitchen to ask do you use tap water etc. Make it easy for your guests to serve themselves as needed. Let me suggest easy "make ahead” Lemon Mint Ice Cubes (blend it up and pour them in ice cube trays. Put them in an ice bucket with a pair of tongs so they are ready for your guests to enjoy. Oh and If you have some left over put them in an airtight freezer storage container so they you can use them for your water, cocktails, smoothies, or even soup. Dessert Time- You did great and everyone's happy and stuffed but of course eager for holiday dessert where they can splurge on all the deliciousness they want. Do yourself a favor serve dessert on pretty eco-friendly paper plates, paper napkins, and utensils. I know you're saying how lame when I went through all the trouble for a sit-down dinner but trust me you will thank me later. Nowadays you can find and or order amazing party ware to keep things classy. Check out my Amazon Shop for some Easter products I love. In the meantime, I hope you take the time to kick up your feet for at least 5 seconds before your guests start to leave and you have a houseful of dishes, and clean up. Just remember in the end it's all worth it! Celebrating traditions with your loved one and passing on memories to the younger generation. Be sure to check later on this week for my tips on No Fuss Hosting Part Two, Tablescape, Easter Basket Tips and much more.